I have a small kitchen. Before those of you in tiny apartments in places like New York City or Paris freak out, I know that yours is smaller. You have REALLY small kitchens. You are amazing. But I do still have a small kitchen, especially considering that I cook (and photograph) in it about 30 hours a week. I am still working on getting it completely organized (so far our popular tupperware organization post is still my greatest organizational triumph! ), but I do have 5 things in the kitchen that have helped it feel a little bit bigger, and wanted to share them with you. This is our newest kitchen addition, thanks to some nasty mold that was growing in our master bedroom. Turns out our kitchen is so small and enclosed, and our original hood fan was so weak, that the moist air from cooking and dishes was getting funneled down the hall and into our bedroom. The contractor who did our mold remediation suggested this hood vent fan because it’s incredibly quiet for how powerful it is, and it’s under $150. I LOVE it! We tried 6 different options for kitchen garbage cans, before finally realizing that the answer had been in our house all along. 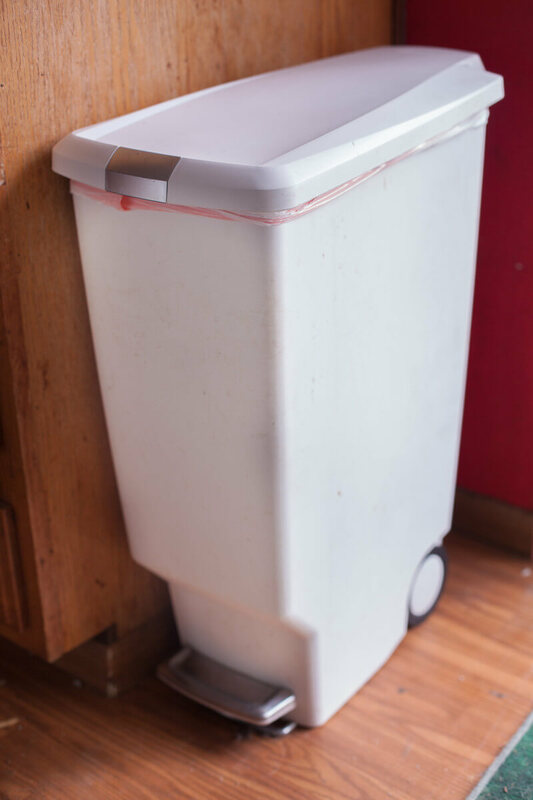 This slim kitchen trash can from simplehuman had been in our bathroom for a few years as our cloth diaper pail. After going through yet another kitchen can that didn’t work, we realized we just needed to use the can we’ve always loved, but thought of as a diaper pail! It’s nice and slim, just over 10 inches wide, so fits well next to a cabinet. 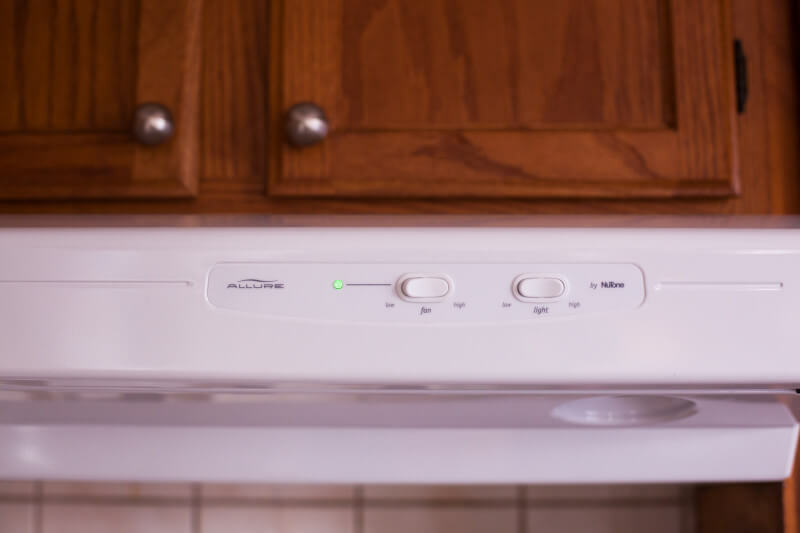 It closes gently and quietly and keeps odors in well, which is important since small kitchens trap smells for days. It has a really sturdy step pedal and opening/closing mechanism, and you can also lock it which has become a necessity in our home with two little kids and a big dog. Plus it has wheels! Every once in a while I get in trouble with Eric for overloading the garbage can. But when I do so, it’s really nice that we can easily wheel it outside right next to our trash collection bin. The wheels are also great for moving it around to other rooms for big cleaning jobs. 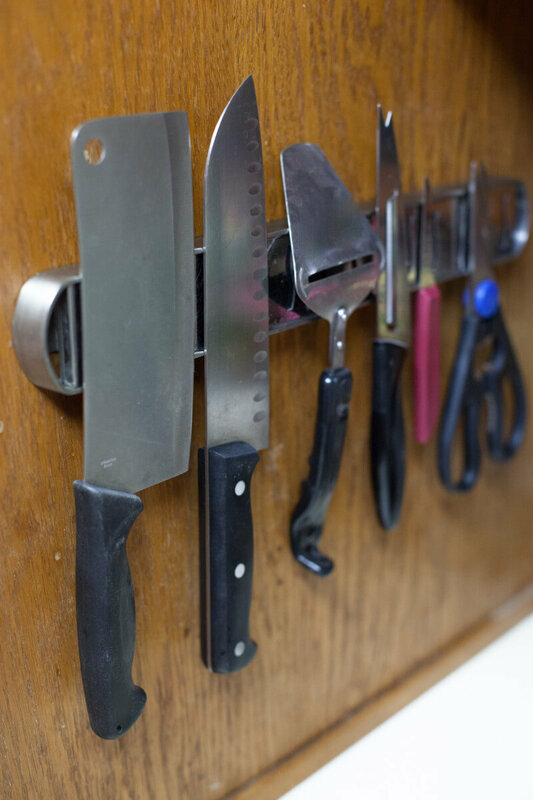 A magnetic knife strip can keep your blades in good shape (don’t store knives in a drawer!!! ), and prevent a knife block from taking up precious counter space. After reading lots of reviews, we went with this one by MIU France because it’s the perfect size to fit on the side of our cupboard, and the strength of the magnet is just right for safely storing and removing our knives. We’ve used it for almost six years now and still love it. I can’t believe it took me so long to figure out a good pantry solution for our small kitchens. In our little apartment, I could have fit this bookshelf right next to our fridge instead of storing food in the bathroom and hall closets! Now we have two of them on the wall in our dining room, and it’s so incredibly convenient to have an actual pantry right next to the kitchen. I cook 30+ hours a week for my job, so probably store more ingredients than the average person would need, so you could most likely get away with just one. My mother in law got us the Billy bookcases from Ikea as a gift, then we added the doors later when we could afford them. It comes out to around $170 each, and we like them so much that we plan to get some more for storage in other parts of the house. 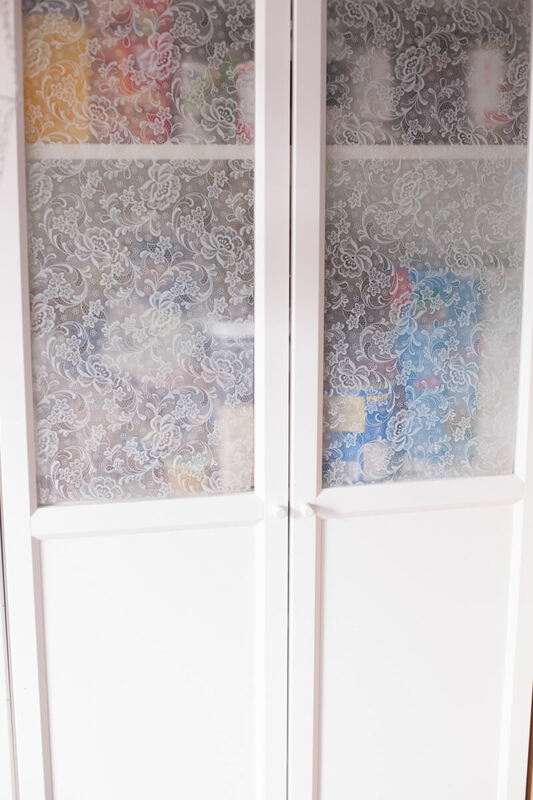 If you don’t have an Ikea near you, I used one of these Closetmaid cabinets in a kitchen I used to teach at, and it’s a pretty affordable option at around $60 (at the time of writing this post). Okay this last one might seem frivolous to non-coffee drinkers, but we are coffee lovers. As I’m sure you know, anything you can do to get appliances off your counter makes a big difference in small kitchens. 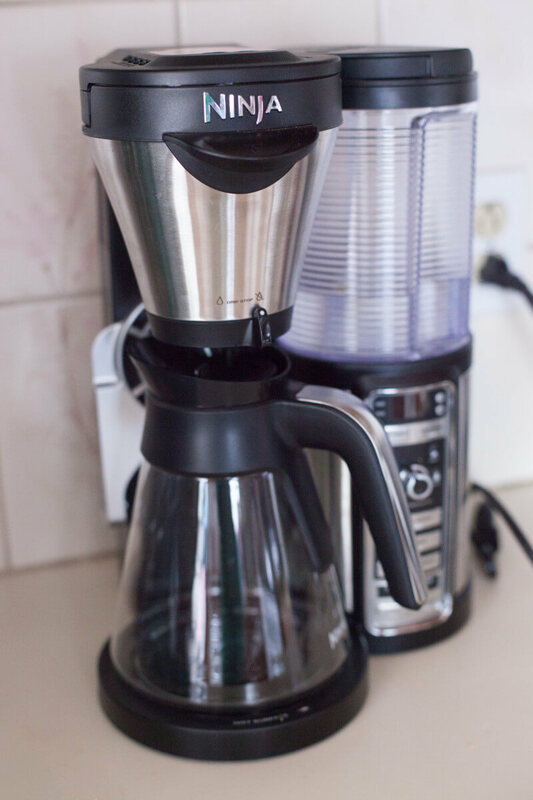 Well a few months ago I was sent the new Ninja Coffee Bar to test, and I was so impressed with it that I got rid of our espresso machine and coffee pot! While they’re careful to say “espresso style” or “coffeehouse style”, because it’s not actually espresso, I found that I liked the flavor just as much as from our espresso machine. My favorite thing about the Ninja Coffee Bar is that you can control the amount of coffee grounds. Machines that use pods always have the same amount of grounds and just adjust the water. With the coffee bar you can add more grounds if you want it stronger. Plus you can just use the permanent filter and not have any added expense or trash. 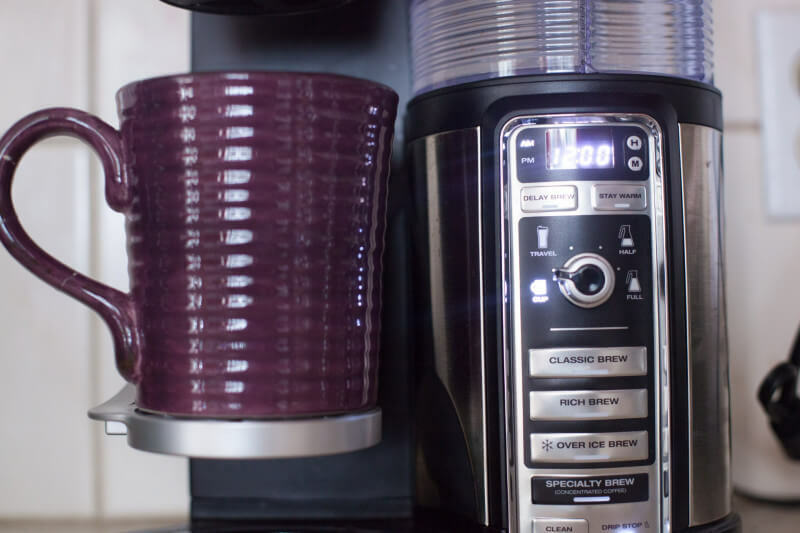 It can also brew a big pot of coffee, and has a timer setting for those of you who want to wake up to the smell of fresh coffee. No, they’re not paying me to promote it, thought I did receive it for free. I just REALLY like it, a LOT! 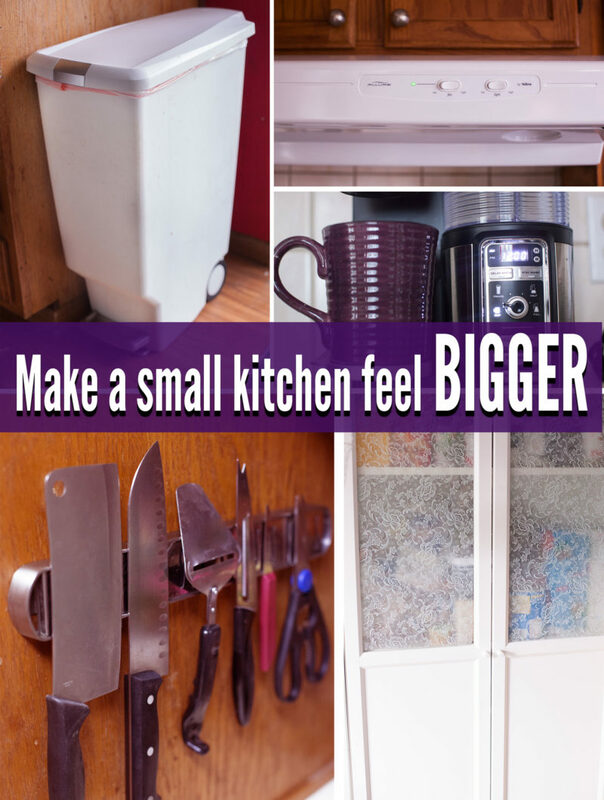 Do you have a small kitchen? We’d love to hear any tips you have for organizing it. Feel free to share them in the comments below!